If you've stumbled across my website, you're probably wondering who I am, and what the heck is a Dwyrin. Well, simply put, I am a 5Dan amateur go player who has been teaching the game for around ten years now. Let's not get into how long I've actually been playing. As for what a Dwyrin is, I'll explain that a little bit later. You see, once upon a time I began learning this game that a friend had brought to my attention after stumbling upon it during a vacation. What I didn't know then but quickly found out was that I had a peculiar knack for the game. I say peculiar because up until that point the only strategy game I had ever found interesting was an old computer game called Civilization. Computer being the operative word there. Flashy effects and Graphics, those were what I was interested in. Surely I wouldn't take to some stuffy board game. After all, I had previously turned my nose up at chess and rumor had it that Go was more difficult than that. To this day I still can't quite put my finger on just what about the game held my interest that first time, or why I kept playing it. Suffice it to say, with the aid of an internet connection and a horrendous sense of priorities, I found myself with quite a lot of time on my hands to devote to becoming stronger. Unfortunately back then there weren't the newfangled resources everyone now gets to enjoy when studying the game. 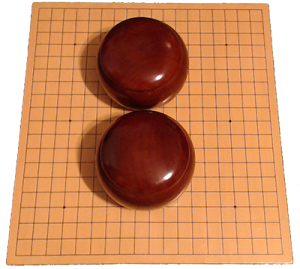 English Go servers were few and far between. There was nowhere, that I knew of, to look up joseki online. And there was certainly no videos from Dans happily posted online whose thoughts you could follow as to where to play and why. It was practically the dark ages. Lucky for me that I did run across a few nice people of moderate strength who were willing to give me pointers. That said, ultimately it was professional games and the countless hours of studying and memorizing them that helped me the most. Playing out the moves on a real board; the very board pictured here and still use today for my videos, was responsible for my rise in strength. Not to mention complete lack of social life. Yes, that last bit certainly helped. Unfortunately it readily became apparent that I had a knack for the game. My friends who first taught me quick found themselves needing handicap and those nice people online who kindly gave me pointers soon found themselves playing me even as well. Why is that unfortunate? Curiosity. If I did have this knack, as was apparent, then how far could that knack take me? Could I reach Dan level? It seemed the only sensible thing was to find out in, let's say, a year. Yes, Dan level in a year seemed like more than enough time to determine if I really had a knack for the game or not. Oh, I'm sorry. Did I not mention I was arrogant? Now before I go any further, I should point out that Dan level back then was different to how it is today. You see there is a server called IGS, but the server today is quite different from how it used to be. Back then the highest rank you could hope to achieve as an amateur was 4Dan. Today it's 7Dan. That made things a little bit more difficult and why I held myself to that rating scale above others. No shortcuts! If I was going to be a Dan player then I was going to be a Dan player in the hardest arena I could test myself. Or not at all. So what did I study? I make no secret of the players I prefer to look at when studying Go. My every lecture has answered that. But I don't think it matters who you study so much as what you get out of the game. For me I focused on the basics. I tried to improve my direction of play and handling of weak groups without succumbing to the temptation of overplaying. That, if nothing else, is the raid boss everyone must face in Go. Do you give in and become another pawn in overplaying's army, knowing full well the average player makes so many mistakes they'll never be able to really take advantage of your bad moves. Or, even knowing you'll never be professional, will you strive for honest and solid play. I'll let you guess which one is more difficult. If you're curious about just how exactly my style of play and how it changed over this time, feel free to look up Journey Through Go here on the site. Suffice it to say I did manage to acquire that shiny 1Dan next to my name and it was shortly after that I decided to teach others. Well, after another year or two of rising to 5Dan, that is. And just like rise my in go, I was always on the lookout for ways to make my teaching better. One on one lessons were obvious. But there had to be other ways to impart information. This led to group lessons which I still give every other Wednesday only, not everyone was able to attend a lecture on a specific time each day. A couple of upgrades to my computer, some troubleshooting of microphone issues, testing out of various recording programs, and now I record those lessons as well as any game I think could be helpful to you, the viewer. There is more of course. Now that my website is up I have a lot more plans for what I'd like to do in continuing to spread Go and help teach people. However these projects are...ambitious, to say the least. So I'll not go into that now. Suffice it to say plans for completely new series and completely new future content is going to be determined solely by the success of the site. We'll have to wait and see! thanks for — and congratulations on — your new Web site — I am happy not to have to go through your quite mixed channel on YT to find your Go videos now. But I missed the explanation of your nick here — you wrote “As for what a Dwyrin is, I’ll explain that a little bit later”, did you mean you’r explain in another post? Yup! That is correct. I’ll go into where the name came from another time. Nice work on getting a site together, your videos have been a great resource and have definetly improved my knowledge of go and enabled me to be stronger. I also find them thourghly entertaining aswell and always egerly wait for the next one, keep up the good work! I am a big fan of your Go Lectures and other YT Videos! This Page is Awesome! Keep up the good work! If i had the money, I would definitely support you and your efforts from which everybody interested in Go, benefit by watching the free available videos. I am glad that there are people out there in the vastness of the Internet , who are willing to help others. I am forever in your debt for you have changed and influenced my Go in such a positive way. I just wanted to say Thank you! Thanks for putting up this website! You should totally link to your “Bats Journey through Go” videos here! Because i normally focus on more normal openings. And, to be completely honest, I’ve just never studied his games >.> Tell you know, I’ll study some of his games and then decide if i should make a few videos on them! Awesome, make sure you check his games in the 40’s and 50’s, because that is when he really was above anyone else, not really in the shinfuseki era(late 30’s). Hey, don’t need to go to Youtube anymore now, absolutely great idea to create a website ! You’re welcome, glad you like the site! And I have decided that I am going to go ahead with one of my plans very shortly. I hope by next week! Dig the new site. Looking forward to more posts! Both thumbs up to you, sir. Thank you for all of the Go videos you have posted throughout the years. I enjoy them immensely and always learn a lot. I am excited for the continued development of your website. Do you have a place to view information about obtaining private lessons and/or individual game reviews from you? May I ask the general area you live in? Do you primarily do go tutoring and go-related things for income or have you had standard jobs in addition? Hope you’re well, sir. Your teaching is an inspiration and makes me believe i could be a Dan level player one day too. Like so many others I have become interested in the game of Go after watching a certain Anime series. Figuring out that this was a harder game than I thought, I underestimated it as casual chess player, I was very wary about if I want to invest the time into learning it and was close to forgetting about it again. Then I found you. And man I tell you – you motivated me. I am impressed by you as person and player and honestly, I’m surely going to continue playing and learning this awesome game. Being a total beginner I sure have a lot ground to cover but I am thankful that you are helping with this. Maybe one day when I am able to understand the basics I am going to approach you with a request for coaching in the hope that you are still offering it untill then. Joking set aside, you (and those who helped) did an amazing job on the website. It’s sober and beautiful, also very user-friendly. Just as it should be. Thanks for all the time you took making this, I’m sure it’s gonna build up to some interesting results, of course in sente!